The Lightning got the better of the Rangers on Monday night, putting six goals on the board and dominating at Madison Square Garden. Photo courtesy of MSG Photos. For a team that talked about needing to play with desperation and how huge it would be to get a 2-0 series lead, the team as a whole didn’t play with that mentality apart from maybe six minutes in the second period. They took six penalties, allowed a shorthanded goal, and made some crucial mistakes that all led to goals. Tampa Bay forward Tyler Johnson stole the show tonight, registering the first ever Lightning playoff hat trick, scoring a goal shorthanded, on the power play, and at even strength. Johnson now leads the NHL with 11 goals in the playoffs, and he was fantastic tonight. Henrik Lundqvist wasn’t at his best tonight, but his team left him out to dry. He was all alone on the power play, the defensive coverage wasn’t at its best, and the Lightning were locked in and determined tonight. Lundqvist’s record in postseason Game 2s fell to 5-2. In all other playoff games, he’s around or above a .500 record. The six goals allowed were the most Lundqvist has ever allowed in the postseason since his first ever playoff start in 2006. Lundqvist wasn’t his best, but the rest of the team didn’t do all that much to help him. Photo courtesy of MSG Photos. 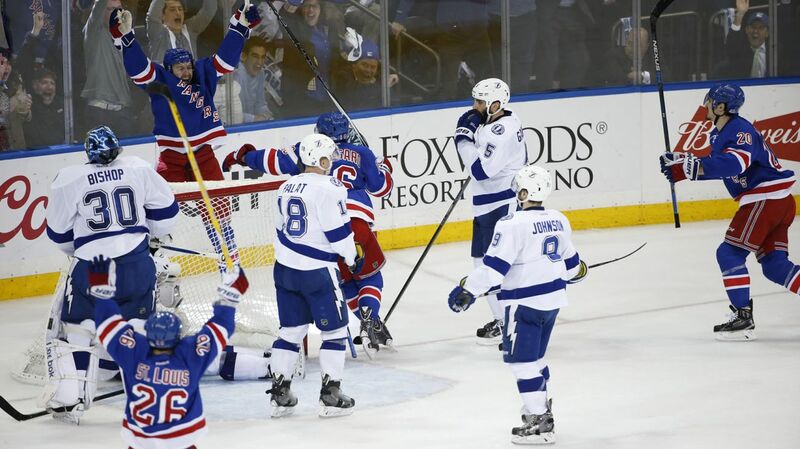 The biggest problem early on was mistakes from the Rangers, which the Lightning capitalized on. Two of the first three Lightning goals, all scored by Tyler Johnson, were off of turnovers, including one goal on a Rangers 5v3 power play. It was sloppy, and put the Rangers in a huge deficit. The first period was weird. There’s no other way to say it. 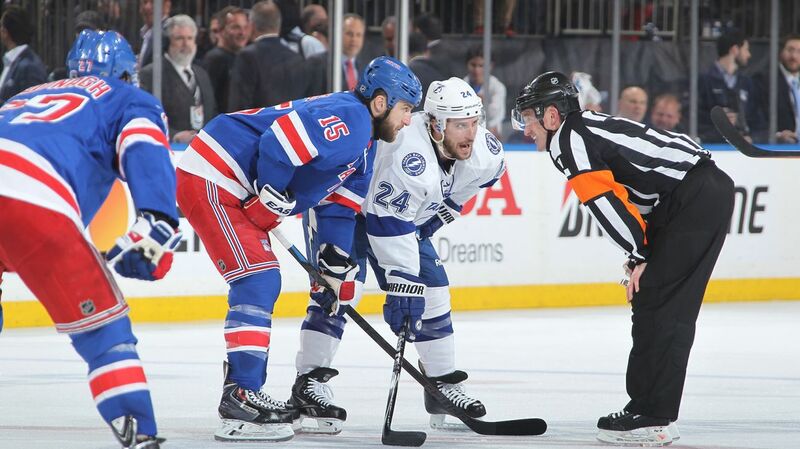 A total of seven penalties were called in the period; three against the Rangers, and four against the Lightning. There was no flow to the period, constant whistles, and penalties every few minutes. Just 4:31 into the game, the Rangers were presented with a huge five one three power play opportunity and a chance to get the first goal of the game. However, it wasn’t the Rangers scoring, but Tyler Johnson on the penalty kill. With the Rangers up two men and the power play unit cycling the puck, Dan Boyle sent a pass to Martin St. Louis at the point. For some reason, it seemed like he was not expecting the pass, and it bounced off his skates as St. Louis fell to the ice as the puck slid into open ice for Johnson to pick up. He went on a breakaway with another teammate, and his initial shot was saved by Lundqvist, with St. Louis diving on the backcheck. The puck went off of Johnson’s skate and past Lundqvist before the net came off of its moorings, giving Tampa Bay a 1-0 lead. On another power play less than three minutes after the goal, the Rangers kept it much simpler, and were able to cash in with a goal to tie the game. 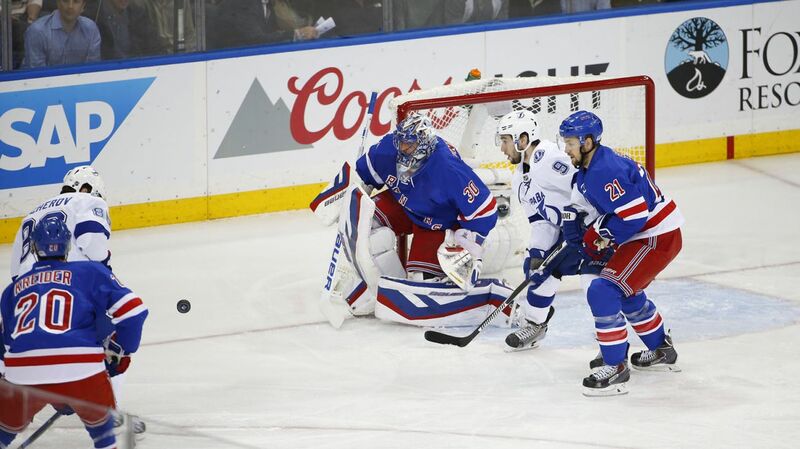 Dan Boyle’s shot from the point was deflected by Martin St. Louis, causing Bishop to lose the rebound. Chris Kreider was right in front of the net, and kicked the loose puck to his stick, sliding the puck past Bishop’s right pad for his team leading sixth goal of the playoffs. Chris Kreider put a rebound past Bishop to tie the game at one early in the first period. Photo courtesy of MSG Photos. Following a few penalties later in the period, the Lightning had a four on three power play, giving them tons of space to work with, which they utilized. Tyler Johnson scored his second goal of the period. Dan Girardi blocked a shot from Steven Stamkos, and missed poking it out of the zone by inches. That put him out of position, and Stamkos got the puck to Johnson down low. Tyler Johnson had enough time to pack a picnic, so he faked a pass to Palat, freezing Lundqvist, and placed a perfect shot top shelf to give the Lightning a 2-1 lead. In the third period, Tampa capitalized on another turnover. It looked like Marc Staal was going to get to a puck and keep it in Tampa’s zone, but he too fell down before getting there, sending the Lightning on another breakaway. Ondrej Palat fired a shot off of the post, and it laid behind Lundqvist in the crease. Tyler Johnson was able to tap in the loose puck, completing the hat trick, the first in Tampa Bay Lightning playoff history. The Rangers were able to get the score back to within one, and it was Derek Stepan scoring on the power play, his fifth goal of the playoffs. It was nearly identical to the first power play goal from Kreider. Dan Boyle’s shot from the point was tipped at Bishop by St. Louis, leaving a rebound for Stepan. Bishop made a fantastic first save on Stepan, but he got the puck behind the net, shooting it off of the back of Braydon Coburn and into the net, cutting the lead to 3-2. Derek Stepan went for a bank shot off of Braydon Coburn, and wound up scoring his fifth goal of the playoffs. Photo courtesy of MSG Photos. The Rangers played their best hockey of this game in those next six minutes, making a huge push but coming up just short, with the Lightning up 3-2 after the first 40 minutes. After taking a penalty in the early stages of the third period, the Rangers took another penalty, a stepan tripping call. On the penalty kill, Rick Nash had a breakaway chance, but shot it right into the chest of Bishop, who then made a terrific left pad save on Jesper Fast to keep the puck out of the net. Just seven seconds after the penalty expired, Alex Killorn scored a goal to extend the goal margin to two. Victor Hedman made a great slap pass to Killorn, fooling everyone, and he had an empty net to shoot at. Lightning would strike three times in that period, with power play goals from Steven Stamkos and Alex Killorn. That ended a depressing night for Rangers fans, and a 6-2 loss with the series heading to Amalie Arena. The Rangers need to burn the tapes from this game and forget about this performance. Clean the slate, and play better in Game 3. It’s a best of five series now. Believe it or not, there are a few positives to take out of this game. The Lightning did all of their damage on special teams. Practically four goals came from the power play, and one shorthanded. If the Rangers stay out of the box, they should be okay. They played well 5v5, looked fantastic when up a man, and scored two power play goals. Just stay out of the box. Dan Boyle had a terrific game. This style of play suits him better, and Boyle has been the best defenseman in the first two games. Derek Stepan is dominant right now, scoring yet another goal and playing a strong overall game. And Chris Kreider continues to net big goals. He’ll need to keep it up. The series shift to Tampa Bay with the best home team in the NHL , Tampa Bay, against the best road team in the NHL, the Rangers. This should be interesting. Posted on May 19, 2015, in Game Recaps and tagged Alain Vigneault, Ben Bishop, Cam Talbot, Carl Hagelin, Chris Kreider, Dan Boyle, Dan Girardi, Derek Stepan, Derick Brassard, Dominic Moore, Hartford Wolf Pack, Henrik Lundqvist, James Sheppard, Jesper Fast, JT Miller, Keith Yandle, Kevin Hayes, Kevin Klein, King Henrik, Madison Square Garden, Marc Staal, Martin St. Louis, Mats Zuccarello, Matt Hunwick, MSG, MSL, New York Rangers, NHL, NHL 2014-2015 Season, NHL Playoffs, NY Rangers, NYR, Rangers, Rangers Nation, Rangerstown, Rick Nash, Ryan Bourque, Ryan McDonagh, Stanley Cup Playoffs, Steven Stamkos, Tampa Bay Lightning, Tanner Glass, The Ranger Zone, Tyler Johnson. Bookmark the permalink. Leave a comment.